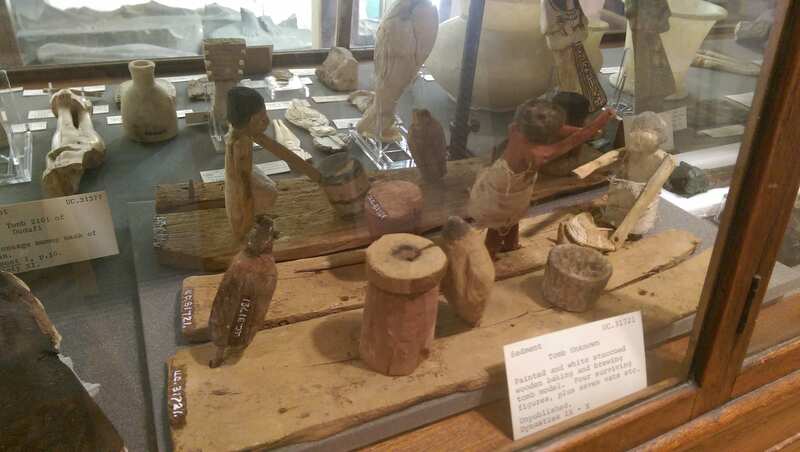 The Petrie Museum at University College London contains a vast and varied collection of archaeological artefacts from Egypt, ranging from Palaeolithic stone tools to the first naturalistic mummy portraits from Roman Egypt. 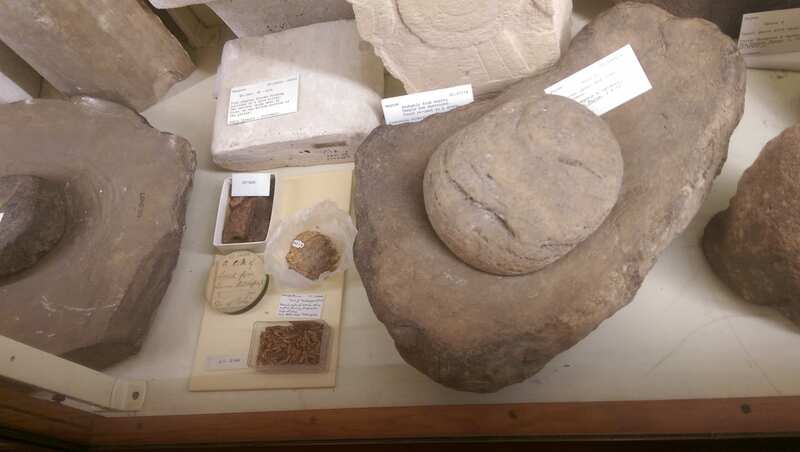 Many are also the organic materials at the Petrie Museum, which preserved archaeologically thanks to the dry and arid climate conditions in Egypt. 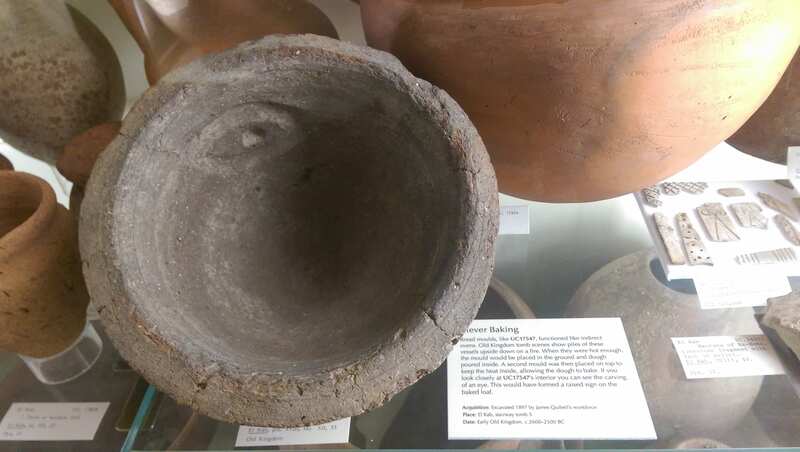 Amongst these, the museum houses some remarkable examples of foods and drinks, such as several bread loaves, fruits and even beer residue recovered during excavations from different archaeological sites in Egypt. In order to create a direct link with my PhD project on Neolithic cereal foods from Çatalhöyük (Turkey) and to show visitors how cereal foods get preserved archaeologically and how important these were in past societies, I put together a display with the help of Dr. Alice Stevenson (former curator of the Petrie Museum), with some of the best examples kept at the museum (Fig. 1). We chose a loaf of bread from Hatshepsut’s tomb in Deir el Bahri (ca. 1458 BC), beer residue from inside a ceramic vessel and emmer wheat spikelets. Emmer, an ancient crop originated in the Near East, was domesticated 12,000 years ago in Syria as new archaeobotanical research has recently shown (Arranz-Oteagui et al. 2016); and it was also, together with barley, the staple crop in ancient Egypt used by the community on a daily basis. 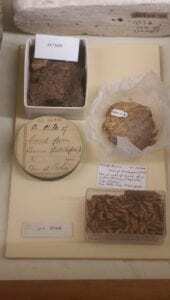 “emmer needs an extensive treatment; when threshed, it breaks into packets called spikelets, each of which is a thick envelope of chaff tightly surrounding two kernels. Vigorous but careful processing is needed to break the chaff apart without damaging the grain kernels, before winnowing and sieving clean the chaff from the kernels”. And she continues: “Whole spikelets were moistened with a little water and pounded with wooden pestles in limestone mortars (…) the damp mixture of freed grain kernels and broken chaff then had to be dried, probably by spreading the mass in the sunshine. This was followed by a series of winnowing steps, which removed the fine chaff, and by sieving, which removed the heavier pieces”. After this arduous proce ss the grain was finely ready to be ground into flour using saddle querns like those that we can see on display at the Petrie Museum (Fig. 2). Doughs were then baked in bread moulds directly on the embers of the hearths during the Old Kingdom; bread was later baked inside pottery cylinders, on the inner walls, creating a tannur environment. It will not be until the New Kingdom that Egyptians build real bread ovens (tannurs). Using Scanning Electronic Microscopy (SEM) to analyse the microstructure of these breads, Samuel found out that, although mainly made of emmer flour, some of them also contained barley flour and other foods such as figs and dates. Also, under the SEM, it was possible to see that some yeast granules had preserved the desiccation process and were visible. Although yeast is naturally found in the environment, we do not know when or how, was first used for bread baking and so far Samuel’s evidence for the use of yeast for bread baking by ca. 1400 is still the earliest example of its use. Some archaeologists believe its first discovery was probably accidental and that it was probably connected to the preparation of alcoholic drinks or brewing. For Egypt, this could very well be the case, since beer making is widely documented in ancient Egypt. 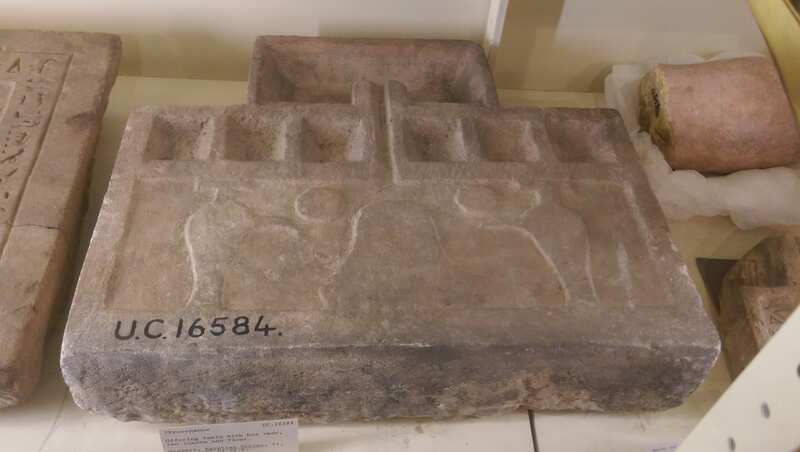 Many are the decorative depictions about brewing: for example, a group of Old Kingdom statuettes is on display at the Cairo Museum, including a female brewer from the mastaba of Meresankh at Giza (JE66624) and a man working with a pottery vessel from the mastaba of Ptahshepses at Saqqara (Cairo CGII~; Saleh and Sourouzian 1987: nos. 52 and 53 respectively). A vari ety of texts also mention bread and beer production. The majority of these are scribal exercises, concerned with converting quantities of grain into loaves and beer of specific strength or quantity. Examples of these exercises can be found in the Rhind Mathematical Papyrus (Peet I 923: 112- 22). Through the study of desiccated beer residue from vessels contents we can learn about the early brewing activities. According to Samuel (1996), Egyptians might have been using up to four different techniques for brewing, which differ from our modern traditional techniques. Samuel concluded that most likely used sprouted/malted grain for brewing but also unsprouted grain which could have been processed in other ways in order to be brewed, such as moisturising non-germinated grain and then heating it. Certainly, this could explain the many different names for the term “beer” in Egypt and thus the possibility of having different types of beer, each of them with different taste and characteristics. Samuel, C. 1996. Archaeology of ancient Egyptian beer. Journal of the American Society of Brewing Chemists 54:3-12. Samuel, D. 2000. Brewing and baking in Ancient Egyptian materials and technology. Edited by P. T. Nicholson and I. Shaw, pp. 537-576. Cambridge: Cambridge University Press.